Acrylic paint is more versatile than any other paint with flexibility and adhesion that are completely different from that of oil or watercolor. They can lay down thin in washes like watercolor, go on heavy like buttery oil paint, or take on a variety of aggregates for texture. With acrylic paint, comes a wealth of mediums, gels and pastes to alter the paint even more, like adding open time, or creating matte or high gloss finishes. Modern artists have the benefit, too, of excellent technicians and conservators that have a rich knowledge of acrylic properties to lean on when questions arise. Below is an overall list of most of the mediums on the market, with exception to brand specific mediums. Mediums: Mediums are products that can be added to paint in any quantity to change its characteristics. Mediums can be brand specific, but are usually the same across the board, and can often be safely interchanged with other brands of paint. Mediums are often milky when wet, but dry clear. It is always advised to test mixtures before applying to a painting. 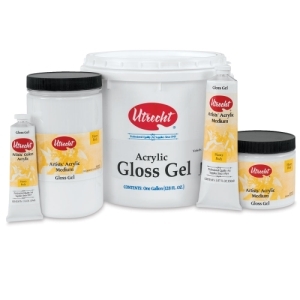 Gels are used for changing viscosity, extending color, and altering the finish. They are also excellent for adhesion in mixed media work. Pastes are similar to gels in consistency or viscosity but usually dry opaque. If you have technical questions about which mediums are the best to use for a particular process, contact the manufacturer of the product as they are usually the best resource. Retailer websites also offer great videos and excerpts on medium use as well. We don't recommend using brushes to mix mediums into paints, but there are quite a few of our brush lines that are heavy duty enough to handle a heavy body paint mixture, including Black Steel, Beau Blanc, Golden Stag and Interboro. I am also partial to the Urban FX line for working with acrylics and mediums as they have great sizes and unique shapes. Check out the Dynasty Brush website for more information on our lines of brushes. Our enticing Black Silver line is one of the most versatile brushes we sell. Black Silver is one of those unique brushes that comes in long or short handle options. With a variety of sizes and shapes and priced reasonably, it was designed with the student artist in mind. The synthetic blend of hair is a proprietary blend created for a range of media, so it can be used easily with oils or acrylics and even some watercolor work. Besides being available in so many shapes and sizes, the series includes several of our unique shapes like the Deerfoot, Dagger and Rake, specifically for decorative work and speciality painting styles. Clearly, a great brush for an affordable price. Let us know if you use Black Silver and what you think; share your comments and art here with us.